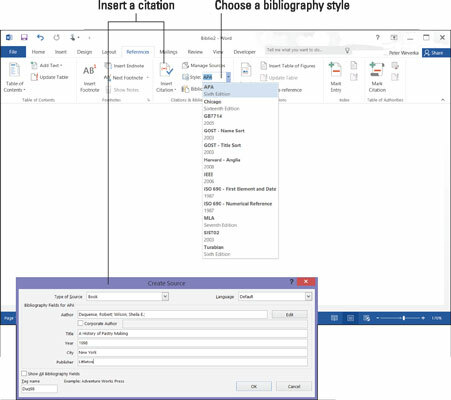 Word 2016’s Bibliography feature is very nice in one regard: It solves the problem of how to enter citations for a bibliography. All you have to do is enter the bare facts about the citation — the author’s name, title, publication date, publisher, and so on — and Word presents this information correctly in the bibliography. You can choose among several popular bibliographical styles (APA, Chicago, and others) from the Style drop-down list, as shown here. After you make your choice, Word reformats all bibliography citations. You don’t have to worry about whether titles should be underlined or italicized, or how authors’ names should be listed in the bibliography. Adding a citation (left) and formatting citations (right) for a bibliography. An abbreviated citation appears in the text of your document in between parentheses where you enter a citation; the complete citation appears in the bibliography. After you enter the information about a citation, entering it a second time is easy because Word keeps a master list of all citations you have used in your work, both in the document you’re working on and your other documents. Entering a citation you’ve already entered in your document: Click the Insert Citation button and choose the citation on the drop-down list. The top of the drop-down list presents citations you’ve already entered. Creating a new citation: Click the Insert Citation button and choose Add New Source. You see the Create Source dialog box shown. Choose an option on the Type of Source drop-down list and enter particulars about the source. You can click the Show All Bibliography Fields check box to enlarge the dialog box and enter all kinds of information about the source. Whether clicking the check box is necessary depends on how detailed you want your bibliography to be. Inserting a citation placeholder: Click the Insert Citation button and choose Add New Placeholder if you’re in a hurry and you don’t currently have all the information you need to describe the source. The Placeholder Name dialog box appears. Enter a placeholder name for the source and click OK. Later, when you have the information for the source, either click the citation in the text and choose Edit Source on its drop-down list or click the Manage Sources button, and in the Source Manager dialog box, select the placeholder name (it has a question mark next to it) and click the Edit button. You see the Edit Source dialog box. Enter the information and click OK.
Inserting a citation you’ve entered in another document: Click the Manage Sources button. You see the Source Manager dialog box. In the Master List, select the source you need if the source is listed; otherwise, click the Browse button, select the document with the source in the Open Source List dialog box, and click Open). Next, click the Copy button to copy sources from the Master List into your document. Then click Close and enter the citation by clicking the Insert Citation button and choosing the name of the citation you copied. Your citation appears in text in parentheses. Move the pointer over the citation and click it to see an inline drop-down menu. From this menu, you can edit the citation as it appears in-text as well as edit it in the bibliography, as shown here. In-text citations have inline drop-down lists. Open the citation’s inline drop-down menu and choose Edit Source. You see the Edit Source dialog box, where you can edit the citation. Click the Manage Sources button on the References tab. The Source Manager dialog box appears. Select the citation, click the Edit button, and change around the citation in the Edit Source dialog box. Changing what’s in parentheses: Open the citation’s drop-down menu and choose Edit Citation. You see the Edit Citation dialog box. To suppress the author’s name, year, or title from appearing inside parentheses, select the Author, Year, or Title check box (whether the citation in parentheses lists the author, year, or title depends on which citation style you choose). To make page numbers appear with the citation, enter page numbers in the Pages box. Removing the in-text citation: Swipe over the citation to select it and press Delete. Removing an in-text citation this way does not prevent the citation from appearing in the bibliography. Click in your document where you want the bibliography to appear. Probably that place is toward the end of the document. On the References tab, open the Style drop-down list and choose a style. If you’re generating your bibliography for a paper you will submit to a journal or institution, ask the editors which style they prefer for bibliographies and choose that style from the list. Click the Manage Sources button. You see the Source Manager dialog box. Citations in the Current List box will appear in your bibliography. If necessary, address citations in the Current List box. If you entered any citation placeholders, their names appear in the list next to question marks. Select these placeholders, click the Edit button, and enter information in the Edit Source dialog box. To keep a citation from appearing in the bibliography, select it and click the Delete button. Click the Close button in the Source Manager dialog box. Click the Bibliography button and choose a built-in bibliography or the Insert Bibliography command on the drop-down list. There it is — your bibliography.